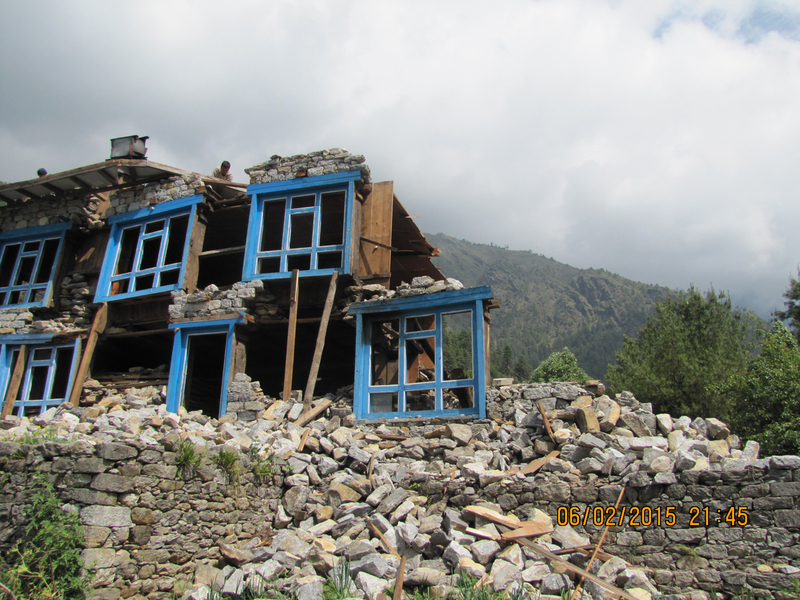 The earthquake of April 25, 2015 devastated these four rural villages, including homes, schools, shops and monasteries. Located much closer to the epicenter of the second 7.3 earthquake of May 12, 2015, all structures received further damage and all villagers are homeless. Devastating landslides closed trails, isolated villages and created dangerous conditions. All 300+ villagers are living in tents and the monsoon is upon them. Off the main Everest trail, these villages are easily forgotten by the Nepalese government and international relief efforts, so the Bo M. Karlsson Foundation (BMKF), working with The Beyul Hermitage + Farm in Chhuserma, owned by Ngima Gyalgen and Caryl Thornton Sherpa www.thebeyul.com, stepped in to help. Boulders the size of a house came down the mountain. Mountainsides are cracked. Landslides took out all trails. 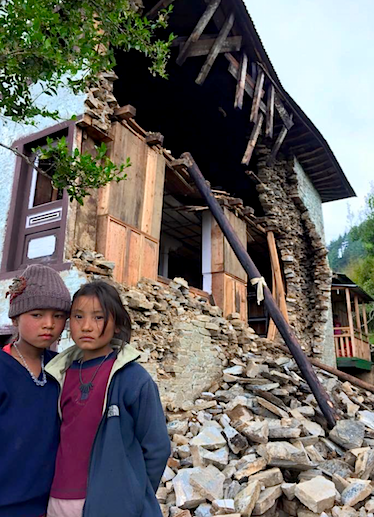 With over 300 aftershocks since the original quake, landslides remained unstable and dangerous to cross, and monsoon rains are not making these trails any safer. Through helicopter drops, the German Red Cross has provided tents to temporarily shelter the families of these villages. Where you live is not about “Location – Location – Location,” but “Community – Community – Community.” Granted, this area of mountains, forests, rivers, and small farming villages is Shangri-La, but without their spirit of cooperation, sharing and concern for all, it would be just another beautiful place on the map, rather than a place to call ‘home.’ There is a reason the world comes once to Nepal and returns often – the spirit of its communities. After the initial shock of the devastation, this community has come together. 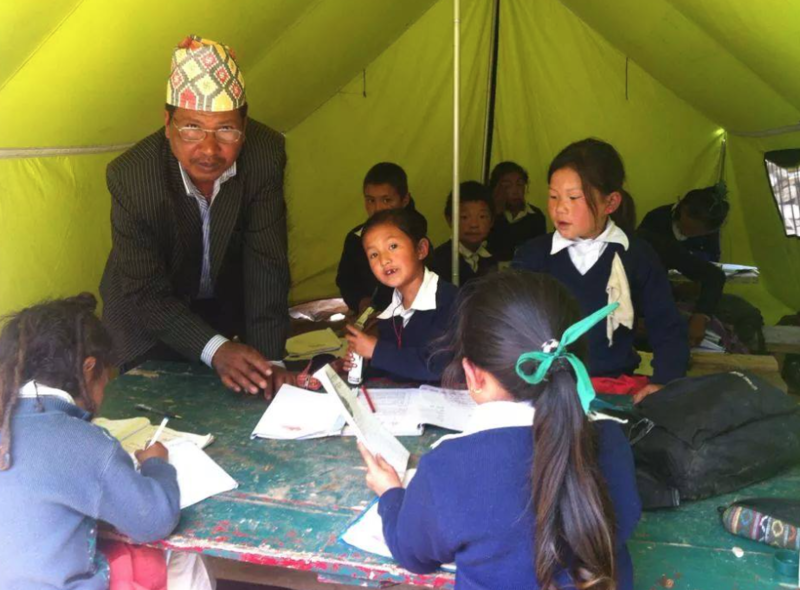 The bad and good news is the government does little in the Solukhumbu District. Bad: little money is provided for schools, infrastructure, such as bridges for safe river crossings, medical facilities or anything else. Good: Being self-governed, the villagers can decide the priorities for their community – and they have. Rebuilding the trail system, so people, animals and aid can travel safely, is their first priority. The second is to rebuild the local school, so the children can spend their days in a safe environment and have some semblance of order to their lives. Their homes will be rebuilt as they can afford to reconstruct them, one stone, one pine board at a time. I imagine the rebuilding to be like ‘barn-raisings’ with some folks building, others carrying supplies, many cooking. Dal bhat or a plate of boiled potatoes anyone? Trails are the highways of Nepal, and pack animals, their semi-trucks. The mountainous terrain is difficult and avalanches have made it dangerous. These villages can only be accessed by foot (porters, dzopkay or donkeys) or by helicopter, which are costly and cannot fly during monsoon. 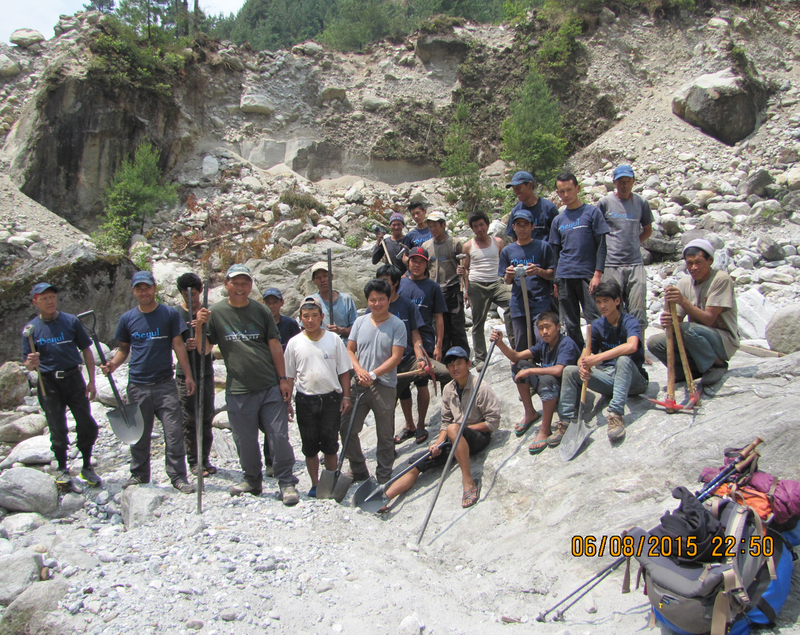 Through your generous donations to BMKF Earthquake Relief/Solukhumbu, Ngima Sherpa hired twenty locals to rebuild the trails, as they had no work without tourists/trekkers visiting Nepal. By hiring locals, your donations helped to empower them and recycled back into the community. In addition, each villager donated one day/week to trail building or two days, if they own animals, as they are destructive to the trails. These men moved ‘mountains’ with simple tools – pick ax, crowbars, shovels – and their herculean strength. Rubble cleared, the land stabilized, and stone steps formed and set into place. The goal was to connect all four villages with the larger communities of Phakding and Ghat across the river. On June 15th, the trail building was complete (except for a small section being done by the Sagarmatha National Park District) and includes two bridges across the Dudh Kosi River! To ensure that education remains in the community and children are not having to walk one to two hours to school, then back each day, the next focus will be on rebuilding the school. While we have raised approximately $5,000 towards this effort, much more is needed. The earthquake destroyed the local school in Sano-Gomela. In 2014, they celebrated their Golden Jubilee, their fifty-year anniversary. Students returned from throughout Nepal to attend the celebration. Until Sir Edmund Hillary and the Hillary Foundation built the ‘Hillary Schools,’ as they became affectionately known, there were no schools in the Solukhumbu, and thus the importance of this institution to the lives of young Sherpas who dreamed of learning more about the world. The children were lucky. “The government estimates that 24,000 classrooms were destroyed, and if the 25 April quake had struck on any other day besides Saturday, a lot of students would have lost their lives,” according to the Nepali Times. UNICEF Nepal estimates that almost a million children will not be able to return to school immediately, but says going back to class and meeting friends again is important for children to overcome their fears. Today I went my previous or childhood school where was I learnt from grade 1 to 7. I was so sad when I saw this school all classroom and building has collapsed. We celebrated 50th anniversary just last year. A gift of approximately $1,000 each has also helped six families with limited resources to begin the rebuilding of their homes. Fortunately, many of the original building materials can be reused, but demolition and rebuilding is a slow process when all work is done by hand. Exterior stone walls were originally dry-stacked, but crumbled easily in a quake, so mortar must now be used, an expensive addition, as concrete is flown from Kathmandu, then carried up the mountain. While there will be no summer vacation for the villagers of Chhuserma, Charmadingma, Gomela and Sano-Gomela, who are busy rebuilding their community, they are grateful for your donations in support of the Solukhumbu! Thank you!! !